As part of its strategy to penetrate the world of sports, Jetcoin has created Stadia for football fans. Unlike most sports apps whose main function is to provide real-time scores and a running commentary, Stadia’s focus is on optimising the experience of football fans during a game. By combining real-time interaction with social media integration, Stadia takes fans right into the heart of the action.Stadia incorporates the flags and colours of 196 countries as well as the top 28 championships in the world, enabling fans to personalise their mobile phones or tablets by proudly displaying the flags and colours of their countries or favourite clubs.Stadia gives fans a voice during live matches with its referee functions. Fans can, with a simple onscreen touch, announce an “Offsite”, “Red card”, “Yellow card”, “Foul” or simply share a moment of triumph by announcing a “Goal!”. With this function, fans can actually express their agreement or disagreement with a referee’s ruling.Stadia also features a unique photo function that displays fans’ favourite countries or club flags at the bottom corner of pictures taken so that they can share memorable moments while showing support for their country and/or team. The photo function offers a direct share to Facebook and automatically saves the picture with the embedded flag to the “Stadia Picture” folder in the phone, thereby allowing fans to retrieve and share those memorable moments on other preferred social networks. 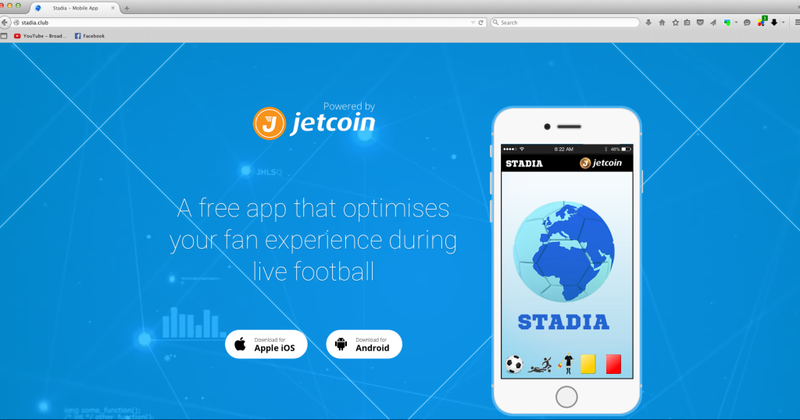 A free app powered by Jetcoin that optimises fan experience during live football, Stadia is currently available for download on Android and iStadia, its IOS version, is available on iTunes store for Apple users. For more information, please visit http://stadia.club. Besides new features that will enable fans to get seat upgrades and dedicated merchandising amongst others, Stadia/iStadia 2.0 will also be featuring the Jet Wallet holding jetcoins (JET).